Center for American Places, 9781935195054, 136pp. The landscape of the Morongo Basin of Southern California's Mojave Desert is dotted with unusual buildings and parcels of land that developed as a result of the Small Tract Act of 1938. The structures, which are remnants of a mid-century homestead movement, have become a lightning rod for seemingly disparate communities wishing to claim and inhabit the desert landscape. In "Jackrabbit Homestead," Kim Stringfellow, an artist and writer known for her cross-disciplinary work addressing the American West, land use, and the built environment, documents the character of the homestead architecture and the homesteaders who built it. Alongside her compelling photographs, she explores the origins of the Homestead movement, the Public Land Survey, and other U.S. public land policies that have shaped our perception and long-term management of the California desert. 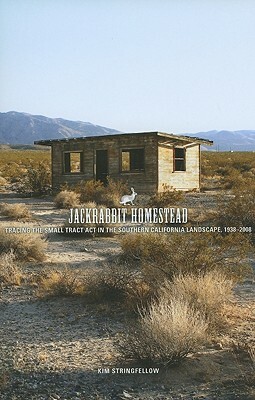 Richly illustrated with Stringfellow's color photographs and historical illustrations, "Jackrabbit Homestead" is an essential document of American landscape history. Kim Stringfellow is an associate professor in the School of Art, Design, and Art History at San Diego State University. She is also the author of "Greetings from the Salton Sea: Folly and Intervention in the Southern California Landscape, 1905 2005.""